The day was just like any other day. I was home from school for the Christmas holidays. My brothers Ochai and Ogbe were coming home from their schools that day. Ochai was coming by road from Calabar and Ogbe by air from Abuja. We were all excited, but my mum was the most excited, ”My boys are coming home”, she kept saying throughout the week, she was so happy, we all were . We made chicken stew and Egusi soup which they both loved, we cleaned the house and looked forward to a blissful Christmas. We just couldn’t wait. That afternoon, my Dad went to the airport to pick Ogbe and my sister was at a Christmas party at her school, so it was just my mum and I at home. I remember we were watching the Miss World competition. I remember that it was Omowunmi Akinnifesi that was representing us. I remember my mum ‘yabbing’ some of the contestants. She had also been feeling uneasy and she kept wondering what was keeping my dad. She called him and she couldn’t understand what he was saying, all she could make out was ‘I don’t know how to tell you’, he kept saying amidst his sobbing and wailing. Immediately she jumped up, ran to her room, wore her green bubu (she doesn’t wear it again), and drove out of the compound all the while saying, ‘God, let nothing happen to my boy, not my boy Ogbe’. I was left alone. By now I knew something was wrong. I tried to pray but I couldn’t. I remember everything vividly. I put on the radio and by then the news was on. A plane carrying school children had crashed at Port-Harcourt International Airport. I called my father to confirm, ‘Daddy, is it true?’, I asked, hoping it was all a sick joke, ‘It’s true, my son Ogbe is no more in this world. Ogbe is gone’. He replied. hmmm… am not sure I can accurately describe what I felt, but i’ll try. My heart dropped. It was such a horrible terrible feeling. What followed was denial, then shock, then the slow realization that all the people in your house were actually sympathisers, that the wailing and weeping wasn’t for nothing. Yup, someone had died. And death is as final as it gets.The days that followed were a blur, nothing seemed real except for the pain. The pain was and is still so real. It’s sharp, acute and physical. Nothing, absolutely nothing can hurt the way the death of a loved one can. Ogbe Daniel Okpe was 13 (June 11, 1992-Dec. 10, 2005). Ogbe was a star. a genius. a clown. He was the light in our home and when he passed, the light went out. He was good at everything, sports, science, arts, clowning around and making people laugh, there was never a dull moment with him around. He wanted to be an aeronautical engineer from his childhood and he always told my mum he would build her a car that could fly because she always complained about traffic. Sosoliso (the name should have warned us) flight 1145 crash landed at Port-Harcourt International Airport, burst into flames and there was no water at the airport. No water and no emergency services, that tragedy could have been avoided 100%. The plane crash killed 103 including 60 students of Loyola Jesuit College, Abuja,(some of the brightest minds of their generation), Pastor Mrs Bimbo Odukoya, Rev. Fr Aloysius Obi (who baptized my brother and 12 of his classmates) and so many others. Two people survived that crash, one of them the beautiful Kechi Okwuchi who remains an inspiration to all of us. Its been 5 years since that horrible tragedy took place. In those 5 years, we have grown stronger and wiser. Death has a way of maturing you and also teaching you that nothing on this earth lasts forever. We have also grown deeper in our faith. A lot of people asked us why God would allow something like that, but God has not said we won’t face trials, He promised to be with us through the waters and through the fire (Isaiah 43:2) and He was with us. He brought us through and we are stronger than ever. 5 years on and I ask myself if anything has changed. Sadly, nothing has. Nigerians still die unnecessarily and there seems to be no solution. We haven’t learnt from the mistakes of the past and Nigeria’s future is paying heavily for that. Even though the tears still flow and we still miss them, we will not spend our time thinking about what could have been. We will honour their memories by living life to the fullest and refusing to give up on this geographical mass called Nigeria for by giving up they would have died for nothing. So this piece is dedicated to all those whose lives were changed that day, Families, friends, schoolmates, colleagues, teachers and even those who didn’t know anyone on that flight, but have faced some sort of tragedy because of our failed system, keep holding on, keep being strong and let’s honour their memories by fighting to make Nigeria a better place. God keep us all and us the strength to move on. This post is heavy. Even though I don’t live in Nigeria at the moment, I remember that day as well. It was all over the news in the UK. I pray God continues to give you peace and strength as the years go on. Even our pain, God miraculously uses it for His glory. In every situation give thanks to d lord. Wow, Omada i can totally relate….So sorry. December 10th 2005 was a black day. I just wish we all would make the lives of these people count by doing great things to better Nigeria. May God continue to give strenght to you and your family. dis is soo sad. i remember vividly. we thank God fr the strenght he has been giving to yur family. it is well. My life was also changed that year ( I lost my dad), albeit in less violent circumstances. It is very difficult to handle loss, but hopefully time can soften the pain. Nigerians always say that “God has taken”, but I don’t agree always. Sometimes it is Nigeria that takes away our loved ones. We have to fight to make Nigeria a better place, power will not surrender to reason without a fight. P.S. Are you the same BN reader that leaves comments with the handle “Omada”? I’ve just joined the group. Things will get better, but we have to make them. It’s difficult to lose one so young but I hope you get stronger with time. By the way, I haven’t been seeing your comments lately. May God bless you and keep you and your family. Nigeria will be better one day!! Thank you for this beautiful piece. May God bless you and your family. Amen. tears….. i cant stop weeping. mostly for a survivor i saw in True Love one year after the crash…. she was not her self physically and psychologically again. The survivor in True love was from the October 2006 Abuja crash.She is okay physically and is doing fine. i am not disputing your, but the survivor i saw, was on the Sosoliso, she was 17, she and pastor Bimbo’s P.A were the only survivor. physically, she had burns and needed a whole lot of skin works. But i pray by God that she is OK now in Jesus name. Amen. 🙁 may God continue to console all dose dat lost loved ones,frnds and family..esp LJC family that lost 60 of their students..
like you rightly said,we cant continue to ask God why,he gives and He has taken..all we can do is to live our lives to its maximum..life is a date locked between two hyphens,the day u come and the day u go..maximize the moment, maximize ur potentials..
and to this failing state called nigeria..all i can say is MAY GOD HELP US. The Saints preserve us, I didn’t know anybody on that flight but I wept for 2 days after it. It was the saddest thing I’d ever heard, 60 children dying at the same time, especially the family that lost all their children. God forbid a thing like this ever happens again. May their souls rest in perfect peace. Good one BN! I agree, it really made us feel bad, even my mom back then was trying to see if there was any way of trying to help her get IVF to at least have another child. I didnt know anyone who died personally but am connected to many who did. Omada my dear, may God continue to keep your family strong and shower you with His love. Thanks so much for sharing this, my tears I’m shedding pales in comparison to that which your family has shed over the years. God bless you. the scene of the lady crying at the airport is still etched in my memory. My hearts go out to all the parents and families of those that lost their lives on that fateful day,5years today… Especially the Lady that lost all her 3 kids…. I say a silent prayer for u all… God is ur comforter, and he and only him has seen you through ur loose and would always strengthen you..ALWAYS!!! God bless u al!! I still remember that day vividy. I was pained and shocked at the way so many human lives were wasted unnecessarily because our leaders can’t Be bothered to put in place proper amenities for citizens. The chances however that our country will change is one i am fast losing hope in. When i complained once about how bad the roads are, pple sai i was now forming cosi had lived abroad. our pple have become so used to the rubbish that anyone who demands better is deemed a snub. i pray for the souls lost that day and hope that our country never witnesses such again, AMEN. I pray it gets easier for you and your family! I remembered that day vividly. It shocked me to the core of my being. Omada thanks for immortalizing our love lost. When peace like a river attendeth my way/ When sorrows like sea below rolls/Whatever my lot/Thou hast taught me to say/It is well with my soul. It is well with you and your family Omada; I thank God for the strength he’s given you to bear the loss of a loved one. I commend you for sharing your experience with us, I bet you’ve inspired many. No words can fill the void the death of a loved one leaves but I thank God for comforting you all in your trying times. It is well. Thanks for sharing this… sad but very deep and inspiring. May their Soul rest in peace and may God continue to keep you and all other families. “keep holding on, keep being strong and let’s honour their memories by fighting to make Nigeria a better place.” I agree! I vivid ly remember the day I heard that news. I still remember seeing a woman wailing, holding pictures of her three children who died in the crash. But Omada, I love what you said, that trials will abound doesn’t mean God was sleeping when they do. But He sees us through the hurt and the pain notwithstanding. Believe me, you have a wonderful testimony, that boy is seated on God’s lap rejoicing! Praise God! it seems just like yesterday i rem dis day vividly my neighbour lost his son and God saved my family friends they were meant to travel with sosoliso but they changed their minds and flew with aero contractor instead…hmmn it soo painful but just know that God would not give you more than you can bear, his Grace would be sufficient 4 u. May God continue to give you the peace and comfort needed to bear the loss. It’s a hard day to forget. I really know how that feels but God sees us thru it all. If not for God, humans would have been going crazy in an instant, but God heals and gives a certain peace that him alone can give which enables one to laugh and smile inspite af all the pain. Its good to trust God. God bless and keep your family, Omada. My heart goes out to all the parents and families of those that lost their lives on that fateful day,5years today… Especially the Lady that lost all her 3 kids…. I say a silent prayer for u all… God is ur comforter, and he and only him has seen you through ur loose and would always strengthen you..ALWAYS!!! God bless u al!! From God we came, and to God we shall return. i’m speechless, let us celebrate these lil angels so that dia death will not be in vain and my prayers are with you and the families that lost dear ones in dis tragedy… May God continue to grant u all peace and kip u all to see the goodness he has in store for you all….omada be strong..lov you!! God will continue to strengthen you and your family, and our nation as a whole. Thank you for sharing your family’s faith, strength and courage during an unimaginable period. I also remember this day clearly. I was studying for my final exams in the UK when I saw the news in the evening. I was so shocked and although I did not personally know anyone in the crash, I shared the pain of the families who lost their loved ones. May God continue to be with all the families and help us turn Nigeria around. I know what its like to loose a sibling and till this day i hate seeing strangers in my home. It reminds of mourning and all those visits and telling us to take heart, “it is well”. I dont wish anybody that. I do know that you feel better eventually and can think of the good times. May d souls of d departed cont 2 R.I.P & may their loved ones cont 2 grow strong wit God. I pray dat Nigeria improves 4 d best & such avoidable disasters b averted in future. Amin. Accept my condolences and also to families who lost loved ones on the crash. I do believe the aviation sector has improved over the last five years to combat such unforseen contingencies. I ALWAYS remember them…. those young children, the other passengers…. and like others have mentioned, it is totally impossible to forget the woman who lost her 3 kids. I sill grieve over them. Time do not heal this kind of wound. One only learns to cope with the obvious. I recall that day crystal clearly. I was studying for my GMAT when my sister got that phone call. Needless to say my zeal to read became history. This is very true. Only God’s hands can hold you and actually see you through. I lost my brother in a horrific fire accident and I know what you mean. thanks o! u no wan tell me your name? i was your pioneer assembly prefect..lol. does that help?? This is a heavy post! I’m almost in tears cos I remember my close friend went to school there, and had some friends on that plane. What’s even more depressing is the fact that it took such a tragedy to happen for the aviation industry to be revamped. My condolenses to the families of all those that were affected. Touche!still in tears…our lost loved ones will continue to be stars shining in our lives till we meet to part no more.They re at peace in the sweet bossom of the Lord. Nigeria has stood in the corner while Death has snatched away too many of our loved ones. Why should we allow Nigeria perpetrate this gross injustice? It is up to US to ensure there’s water in the airport, it’s up to us to ensure that our airport attendant staff are trained in emergency preparedness and first aid. Let us ensure that our airports remember to pay their Water Board bills so that fire fighter can do their job. Nigeria, no be only mouth o! we must ensure that these souls didn’t pass on for nothing. May their souls rest in peace and may their families find the strength to bear the loss. May God continue to comfort the families who lost their loved ones in this preventable tragedy. I know exactly how you feel now and must have felt then. Don’t worry, God is in control. nice one….may GOd in his infinite mercy grant u and ur family mercy. Dear Omada, i graduated from Loyola in 2005,june 2 be precise, so i knew most of the kids who were involved in d crash except 4 those who were the fresh september intakes.most of them hadn’t just been schoolmates,they had become more like family,friends who would never be forgotten. although d tears still come now & then, the only consolation we hav is that they are in a better place,in the Lord’s bossom, angels watching over us. every experience brings with it a lesson, personally,i learnt 2 cherish every loved one, every true friend and every moment with them because u just never know. . they say that 2 live in d hearts of your loved ones is not to die, our loyola angels will forever live in our hearts. It’s just so sad. May the Lord God continue to comfort you&your family and all the other families who lost loved ones on that flight. May we begin to hold our leaders accountable and take responsibility for our actions. I just flew into PH on a flight with loads of school kids who were coming home for xmas. I suddenly remembered that black day in December, 2005. I had been out of time for a few days and i could not wait to go back into the lving and innocent arms of my lovely daughter.Suddenly, i remembered the parents whose lives were changed by that black day and would never have their sons and daughters to warmly embrace them when they return from trips.Earlier this morning, i was worried about loads of material things that seem to have gone wrong, while flying with those school kids today i chose to count my blessings and remembered that God who is seeing families like the ones described in this article through real pain and healing their lacerated hearts is able to handle my little problems. Recently, I lost an aunt and I still can’t help hoping that it’s all a lie- that she’ll turn up one day. Death is indeed a bummer and we can only hold on to God to heal all grieving hearts. MAY GOD COMFORT THE FAMILIES AND THE SOUL OF THE DEPARTED REST IN PEACE. I would never forget that day,never,my baby sister was in that plane,and my aunty’s only son at LJC. Till today,she keeps blaming God,and what do we say?May God grant us the fortitude to bear the loss. Brilliant is all I can say,if your brother was anything like you my love,we sure did loose a star,peace to him. I remember when it happened. Was in SS1 then and we just finished writing exams. That was the morning we were going home and they called an emergency assembly to announce the news. Still so sad now. May they all rest in God’s peace. So sad…But it is well. I felt so bad for the family of the deceased but also the staff of Loyola Jesuit Abuja who lost so many pupils. I hope the families are all keeping well. God is your strength. Sometimes we forget those who are gone and how their time with us impacted greatly in our lives. This piece is so touchy, while reading I hoped it was just a story. Then I remebered…. ; It is well, It will be better 1 day & I’ll pray for d soul of ur brother Ogbe & all d other souls. Take heart & believe that Ogbe is in a better place where there is no sorrow or weeping. cant forget that day and the woman that lost her 3 kids,the egyptians u saw u shall see no more,its well my dear. I couldn’t stop crying when reading this touching piece. The death of a loved one always feels like the end of the world, the strength to keep living completely leaves you, but with God and prayers, you go through the pain and come out stronger, wiser and mature. It makes you realise no one is immortal and that life is too short and precious. May the good Lord continue to be with you and your family. Reading this post brought tears to my eyes all over again. A friend lost his niece on that plane. My mum, who was in Abuja for a convention almost boarded that flight but instead booked the next sosoliso flight, which never came cos the plane had crashed. Omada, please be consoled. Its a heavy burden but will eventually lighten. So so sorry. May their souls all rest in peace. its so sad i dont know what to say, this shouldnt happen to us again in jesus name. Thank you for sharing Omada, glad that you have found strength in your faith & the heart for Nigeria to be a better place…. saying i know how u feel will be a blatant lie cause no one can feel the pain as much as the one goin through it. tears are still sliding down,thanx for havin the courage to share this. i remember Moments with Mo years later,and i found out that one of my schoolmates lost his only sibling too. This post is heavy,I can’t stop weeping,but my prayer is God should continue to comfort the family and friends effected. I am so sorry. Lost my niece Owanari in that accident. Will* never* forget* the* pain*bitterness*anger* sorrow! i remember this incident so vividly.though i knew no one personally but i cried uncontrollably for days for those children and their families and also Pst. Bimbo Odukoya. it is well Omada, what can i say, your brother is with the Lord, the best place he can ever wish for and only the all wise God knows why it happened as it did. take heart dear!!! A very painful day! !life and Death, became much real after that day! !can never forget the pain I felt knowing peter, ur bro, my lil cousin …d list goes were dead! Take heart my dear!God will restore! I cried today and the next day after the crash (the day I found out). On the crash day I told some people in my school about what terrible thing had happened in Nigeria. I remember that period vividly!! 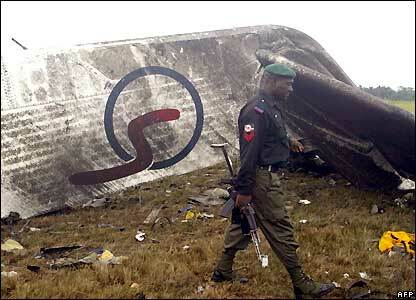 I went to school in ABEC Port Harcourt and Many people who died on that plane were friends to someone in my school!!! We didn’t even know (because we were set to vacate a week after Loyola Jesuit), not until one of our angry teachers came into the Chapel on Sunday and was yelling at us that we should learn how to be grateful to GOD saying we were NOT better than anyone on that flight!!! My friend loss her mom who walked with NNPC and was on that flight returning from a business whatever!!! I remember us watching the news on TV to see people whom we may have known… I remember that day being one of the worst days in our boarding school!! I remember my mom cursing the failed Nigerian system. I remember a lot!!! Rest in Peace Mrs. Manilla, Ogbe Daniel Okpe, Pastor Bimbo Odukoya and everyone else. May GOD ALMIGHTY save us from the terrible claws of this crappy Nigerian System (you do NOT have to be in Nigeria to be affected by the system)!! Very touching. May their souls continue to rest in the lord. The death of a loved one is always never an easy step to go past by. But God gives and takes and he will always give us the strength to progress at the hardest and most trying moments of our lives. Since this sad event, has anything changed? The answer is absolute no. God to our airports and see how dirty and unkempt they are. Infrastructures are damn dead and yet we assume we have government in that country. How does one explain that in a place as important and delicate as an airport, there is no water for fire-fighters to use in such emergency? It is a shame. Nothing has really changed. We seem to have dull heads always in government. Or is it that they know what is right to do but will never do it because of their selfish aims? Things must really change in this country. The corruption in Nigeria stinks to high heavens. May the soul of those innocent kids rest in perfect peace. But God will not forgive you and i if we continue to keep quiet and not do something in our little ways to correct things in Nigeria. We can’t possibly continue this way. Nothing works in that country. awwww, i didnt loose anyone in dat incident but it tore my heart apart and even the pple that got burnt in the alakija-badagry expressway tore at my heart. WE NEED A REVOLUTION, A REALLY SUDDEN RADICAL CHANGE. WE THE YOUNG PEOPLE NEED TO STAND UP AND SAY ENOUGH IS ENOUGH, WE NEED TO VOTE NOW AND VOTE RIGHT. ALL THOSE WHO BELIEVE IN THIS CAMPAIGN, SPREAD THE WORD. Thank you for sharing your story, I can imagine the pain you all have gone through, One family lost all 3 of their kids on that flight and another lost their only child. May God continue to be with you, your family and the other families who lost their beautiful ones. This story hits home dearly as my younger sister was in Loyola at that time and was on the Abuja to Lagos plane. My sister mentioned of how many families are so scarred from the experience that they travel by road no matter how long the journey takes. I remember this day soo well………..i cried, and cried, altho i didn’t know anyone on dat flight personaly, im crying now….God that woman who lost all 3, i remember d clips at the airport when she didn’t know if she was coming or going….i remember the first year anniversary and her dancing to Onyeka….Kai, Omada, God is not sleeping! !….He has given u the strength to come thru this..and it’s all for His glory. i am a 35years old educated carpentar.its bn challenging lately.but wn i saw dis article and searchd out Kechi Okwuchi online.it all came back and d tears couldnt stop. I think i have so many things to be thankful for..am so blessed to have beautiful people around me…………………….and i know as a nation..we would get there someday.Corruption is our greatest problem! I go to LJC presently and trust me,the pain of December 10 is still fresh in us. Every year we commemorate the passing of our angels and we try to look for a plus to all of this; at least now we have 60 representatives in heaven. However, it would still do a lot of good if we,as a nation, learnt from our mistakes and forged ahead making sure to prevent future occurences of such disasters. As i read this,a mini unnecessary war,yes when people face each other to attack is war going on in this country.could have been avoid only if we Nigerians help each other genuinely.still cannot understand no water in the airport part where there is genuine care.